On Saturday, Dec. 1, the Loras Wrestling team traveled to La Crosse, Wisconsin, to take on UW-Whitewater and UW-La Crosse. Starting off the day, sophomore Jacob Hiles competed against UW-Whitewater’s Mike Tortorice in the 125 weight category. It was a tough match, but Hiles was defeated via a decision of 7-2. Up next was junior Brice Everson, who scored the first points for the team by defeating Blake Huffmon by fall at the time 2:50 in the 133 weight category. Weighing in at 141 pounds, senior Kevin Kelly followed the trend and scored three more points for the team by winning by decision over Hazen Rice. With a 9-3 lead, UW-Whitewater wasn’t going to let Loras widen the score gap even more. Sophomore Nathan Pitts of the 149 weight group, fell to Bernard Cassella via fall at the time 4:16, which ended up tying the score at 9-9. This tie didn’t last long, for junior Brandon Murray in the 157 weight category gained six more points for the team by defeating Scott Schieldt through a fall at 3:53. Junior wrestler Brice Everson controls his University of Wisconsin-Whitewater opponent after recording a takedown. Murray widened the gap just enough for the team to be able to maintain the lead for the rest of the meet, but it was a close call. Following Murray’s victory, junior Eddie Smith narrowly claimed another win, beating Ryder Sigler through a decision with the score 4-3 in the 165 weight group. With the score 18-9, Nicholas Bonomo of UW-Whitewater inched his team closer to Loras through a win by major decision of 18-4 over senior Sam Schuler in the 174 weight category, bringing the score up to 18-13. Senior Javier Soto, weighing in at 184 pounds, bumped Loras’s score up a little more by defeating Nick Sundberg through a decision of 10-4. In the 197 weight group, Guy Patron Jr. and Riley Kauzlaric competed against one another, and junior Patron Jr. wasn’t able to come out on top, losing to Kauzlaric by a major decision of 9-1. The final match of this meet, taking place in the 285 weight category, saw junior Brody Tupy and Cadin Koeppel wrestle one another. It was a tough match, and Tupy wasn’t quite able to come out on top, losing through a decision. As a result, taking into account the team penalty both sides took, the final score was 20-19 in Loras’s favor. 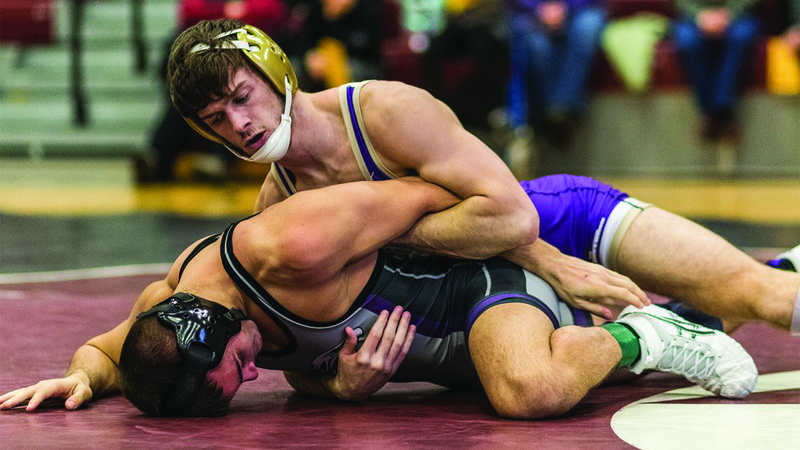 After UW-Whitewater came the meet with UW-La Crosse, which started out with junior Matt Randone defeating Sawyer Sarbacker through a decision of 6-2 in the 125 weight group. Following Randone was Everson, who scored another three points by a decision 5-3. Kelly also wrestled a second time, and won by decision over Hayden Schlough 3-1. With the score 9-0, UW-La Crosse pushed back. In the 149 weight grouping, junior Clint Lembeck fell to Cal Hansen by a decision of 6-3. Murray and Smith got the ball rolling again, both of them winning by a decision of 7-2 over Grant Zamin and Jackson Schoen respectively. After two more wins, the score was now 15-3. UW-La Crosse, not wanting to fall too far behind, claimed three more points by defeating Schuler by a decision of 4-2. Those points didn’t do a lot of good, because Soto gave the Loras team four more points via a major decision of 12-3 over Jake Frost. Patron Jr. was up next, and through a decision win of 5-2 over Adam Gusky, chalked three more points on the board. In the final match of the day, Konrad Ernst of UW-La Crosse gave one final futile push, defeating Tupy by a technical fall of 19-0. At the end, the final score was 22-11, making Loras 3-0 for the season. Up next on the Loras wrestling team’s schedule is a meet against Augustana here in Dubuque, Iowa on Dec. 6 at 7 p.m.